THE B-MOVIE NEWS VAULT: Umbrella Entertainment's April 2019 New Releases! BUSH RANGERS, MAD SCIENTISTS, & MEDIEVAL QUESTS AWAIT YOU IN UMBRELLA'S LATEST BATCH OF BLU-RAYS! After a slow February and a decent March, Umbrella Entertainment is bringing the thunder from Down Under with a decent batch of new DVDs & Blu-rays that you'll want to add to your collections this month! As of April 3rd, you can watch Dennis Hopper terrorize South-Eastern Australia as MAD DOG MORGAN, witness a deranged killer wreak vengeance upon the man who experimented on him in DEATH WARMED UP, or go on a cinematic journey to save a village from the ravages of The Black Death in NAVIGATOR: A MEDIEVAL ODYSSEY! * On May 1st, Umbrella is bringing KRULL to Blu-ray with new cover art, cast & crew audio commentary, making-of featurette, and more! And as an added bonus, this is THE first time KRULL has been featured in its original theatrical aspect ratio! * Also due out on May 1st is SIDECAR RACERS which is part of Umbrella's Ozploitation Classics line. Also be on the lookout for the fantastic anime adventure STEAMBOY, which is packed with special features! * With Rob Zombie's 3 FROM HELL coming to theaters later this year, Umbrella is putting out TWO FROM HELL: HOUSE OF 1,000 CORPSES & THE DEVIL'S REJECTS! This title has new cover art and a ton of extras, including audio commentaries, cast & crew interviews, making-of featurettes, trailers, and more! * Brian Trenchard-Smith's DAY OF THE PANTHER and its sequel STRIKE OF THE PANTHER are coming to Blu-ray in a cool double feature on June 5th! Synopsis: BEFORE DEATHGASM...BEFORE BRAINDEAD... BEFORE BAD TASTE... THERE WAS DEATH WARMED UP! I'LL GET YOU ALL: Interview with actor David Letch. Deleted/Missing scenes with optional audio commentary. 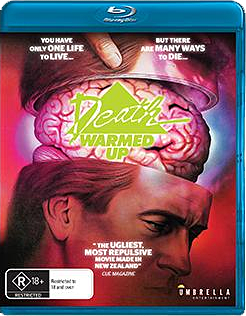 ORDER "DEATH WARMED UP" FROM AMAZON.COM OR UMBRELLA ENTERTAINMENT (DVD | BLU-RAY)! 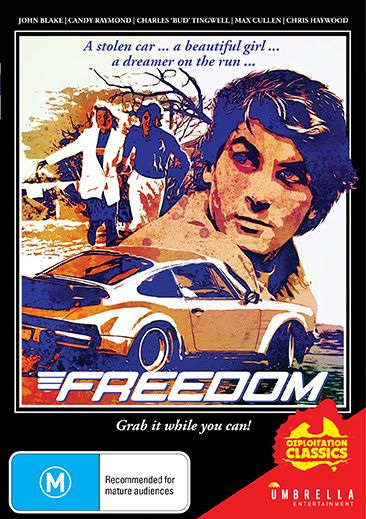 Synopsis: From the award-winning director of Shine, Scott Hicks, comes this seminal Australian road movie tracing one man's search for speed..and freedom. Ron (Jon Blake - ANZACS, THE LIGHTHORSEMEN) is an angry young man with few work prospects having been sacked from his latest factory job. Rebelling against a society that offers him little hope, he lapses into fantasies of driving the highway in a sports car with a beautiful girl and decides finally to steal the Porsche of his dreams. Ron escapes onto the open road and along the way meets the errant Sally (Jad Capelja - PUBERTY BLUES), who wants to retrieve her baby sent to live with foster parents. Chased by the law and their own demons, both risk all in a last attempt to fulfil their dreams. This retro Australian film classic features an all-star cast including Charles Bud Tingwell (INNOCENCE), Chris Haywood (JINDABYNE) and Candy Raymond (DON'S PARTY), while the fast-paced soundtrack was composed by Cold Chisel's Don Walker. ORDER "FREEDOM" ON DVD FROM UMBRELLA ENTERTAINMENT! 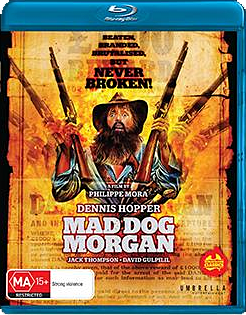 Synopsis: Set in gold rush-era Victoria, and based on a true story, this violent, rollicking portrayal of infamous Irish outlaw Dan Morgan, a bravura performance from an intense Dennis Hopper (EASY RIDER, APOCALYPSE NOW) is a classic of Australia's '70s cinema renaissance. A prospector who turns to crime and opium after failing at gold mining, Dan Morgan spends six brutal years in prison before terrorizing country Victoria with a young Aboriginal, David Gulpilil (WALKABOUT, THE TRACKER). Having escaped into NSW, the bush ranger and his accomplice easily dodge the police and mercilessly intimidate the wealthy land owners but wracked by madness and a lust to avenge an earlier attack from an irate squatter, the notorious Mad Dog makes a perilous journey back into Victoria. Combining an all-star Australian cast, including Jack Thompson, Bill Hunter and John Hargreaves, with a brilliant Dennis Hopper who called the role one of his great life experiences - director Philippe Mora (COMMUNION, HOWLING III) creates one of the great period action dramas. All-new audio commentary with Director Philippe Mora and Jake Wilson, author of Australian Screen Classics: MAD DOG MORGAN! Alternate audio commentary with Director Philippe Mora. TO SHOOT A MAD DOG: Making MAD DOG MORGAN. HOPPING MAD: Looking Back on Mad Dog Morgan. Extended interviews from NOT QUITE HOLLYWOOD: Philippe Mora, producer Jeremy Thomas, camera operator John Seale and cast members Jack Thompson, Roger Ward and Graeme Blundell. MAD COUNTRY: SHOOTING LOCATIONS REVISITED with optional commentary. Interview with Dennis Hopper by Philippe Mora. Radio interview with Philippe Mora. ORDER "MAD DOG MORGAN" ON BLU-RAY NOW FROM AMAZON.COM OR UMBRELLA ENTERTAINMENT! Synopsis: A visionary boy, Griffin (Hamish Gough - AN ANGEL AT MY TABLE) leads five men from the 14th Century into a 20th Century city. Their quest: to save their village before sunrise. It is Cumbria 1348, the year of the Black Death. A medieval mining village lives in fear of the advancing plague. Griffin's older brother, Connor (Bruce Lyons) returns from the outside world in a state of despair, until Griffin tells of his dream – and reveals the only hope of survival. Make a tribute to God. Place a spire on a distant cathedral. Do it before dawn or the village is lost. Audio commentary with actor Paul Livingston and Production Designer Sally Campbell! PATH OF THE NAVIGATOR: VINCENT'S ODYSSEY (40-minute interview featurette with Director, Vincent Ward). 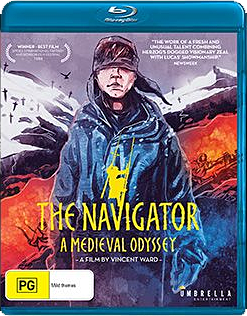 ORDER "THE NAVIGATOR: A MEDIEVAL ODYSSEY" ON BLU-RAY FROM AMAZON.COM OR UMBRELLA ENTERTAINMENT! As usual, all of the DVDs and mentioned in this post can be ordered directly from UMBRELLA ENTERTAINMENT, and are often Region Free!